The Warner Pacific University Library invites the public to a faculty lecture on Thursday, December 6 at 7:00 p.m. in Schlatter Chapel. The Urban Church as Fair-Weather Friend: From White Flight to Gentrification, is presented by Dr. Lloyd Chia, Associate Professor of Social Science, and explores the intersection of urbanization, gentrification, wealth, racial injustice, and faith. During the era of suburbanization and white-flight to the suburbs, many churches chose to follow their wealthier and white constituents out to the suburbs in the name of needing “more space” that the suburbs afforded. In many ways, this was what propelled the mega-church movement of the ’70s and ’80s. Dr. Chia will draw attention to how the urban church failed to work in the best interest of urban communities that needed it most during this time of transition. 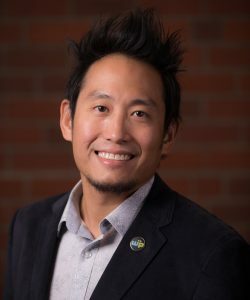 Dr. Chia has published on the Emerging Church Movement in America and researched the experience of LGBT students on Christian College campuses, and why some leave. He is also passionate about diversity, interfaith relations, and race relations. He holds a Ph.D. in Sociology from University of Missouri, and a MSoc.Sci. in Sociology and B.A. in Sociology and History from National University of Singapore. As a son of a pastor and seminary president, Dr. Chia spent most of his life in Singapore, but also lived in Mongolia and New Zealand. He has traveled widely in North America, Central America, Europe, Asia, and Australia. He served as an officer in the Singapore Armed Forces, and was formerly a vocalist for a band that produced two albums and toured extensively in Asia. He was also a collegiate rugby player and coach. Dr. Chia formerly served as worship director of a multicultural church – All Nations Fellowship – in Columbia, Mo.